This is my notes and thoughts during research for finding the best watch for carrying every day. The headline refers to the criteria listed below. First some criteria and things to consider before buying a watch I have to carry ever day. Durability - it has to be able to handle the daily bumps, drops and shocks that happens on a normal day. Water resistent - at least to the ISO 22810 standard - which basically means that you can use the watch daily also while swimming, running and such. Not for SCUBA diving! Precision, the more precisely the better. Preferably radio controlled. Automatic or solar - no need to change battery og wind the watch. 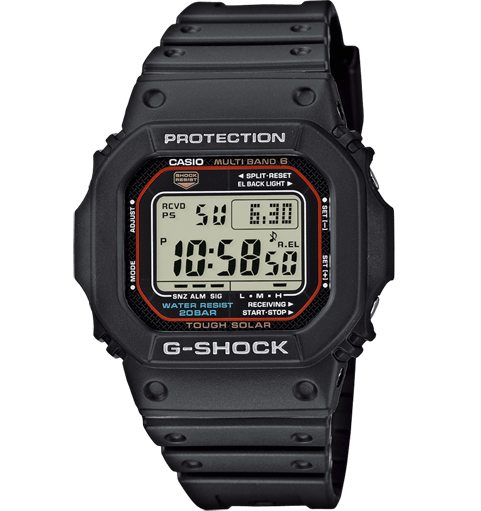 To find a watch that meets these criteria quickly led me to the Casio G-Shock watches. If you filter for both “Solar” and “Wireless (wave ceptor)” it gives 40 watches to choose from. SEIKO PROSPEX SEA series was also considered e.g. SRP779K1 which pretty much my criteria for the best daily watch. I decided a Casio GW-M5610-1ER bought for around EUR 115. This watch meets the criteria in many ways. The price is right - it is hard to find similar specs any other way. For a medium size wrist the Size of the watch fits perfekt. And with only about 50 g you hardly notice wearing the watch. With both solar and radio controlled time and date, the watch is precise and fully powered all the time. I live about 700 km from DCF77 in Mainflingen, Germany. And with the watch laying at the window there is medium to high signal strength. Back light works perfect - and no worries regarding using battery power because with normal use the battery indicator is on “High”.